This is a very realistic recording of a typical summer rain. You can hear distant thunder and the rain varies in its intensity. As with its sister recording, “Rain for Sleeping and Relaxation,” its strong points are in what it does not have. It does not have birds, music, volume spikes, extraneous sounds, wind noise, thunder, or interruptions. The sound volume level is close to constant throughout. The sound quality is fantastic. You can hear individual drips and drops! Though periodic distant thunder can be heard, the volume does not vary much, allowing use as a sleep aid. 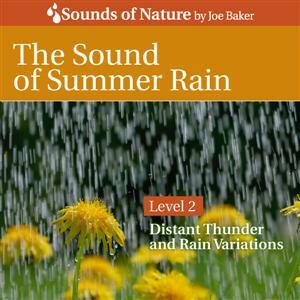 This is the second-gentlest (Level 2) recording of rain in the four part rain series by “The Sounds of Nature by Joe Baker.”. Their “Level 1 Rain for Sleeping and Relaxation” is a constant, steady rain. This recording is more like a real experience. Real raining is hardly ever without some distant thunder or intensity variation. This album contains only one track that is 73 minutes in length with a fade out at the end.